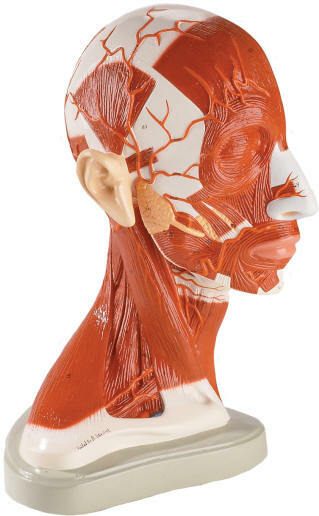 A life-size anatomical model of the right half of the head. 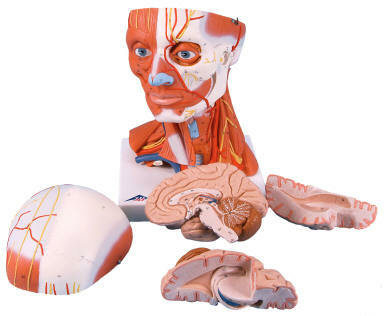 This sagitally sectioned, unbreakable vinyl replica represents the human head and neck down to the level of the clavicle. Surface muscles and blood vessels are depicted on one side, while the other shows the median section through the interior. 19 features are numbered and identified in the corresponding key. PLEASE NOTE: This is hand-made to order model. Allow 4 weeks for delivery. 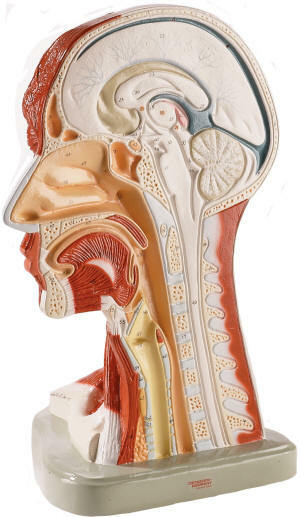 Representation of the superficial muscles of the head and neck showing: parotid gland, submandibular gland (right half), deep musculature (left half), lower jaw partially exposed. Life size. Same as above, but also displays the blood vessels. Same as the basic head model, but also show the nerves. Representation of the superficial musculature and deep muscles, nerves and vessels. Dissectible into skull cap and 3-part brain. Comes with removable base.